Our editor and publisher, Aoife Walsh, was featured in the September/October issue of Prudence Magazine, the Irish glossy for prudent shoppers. 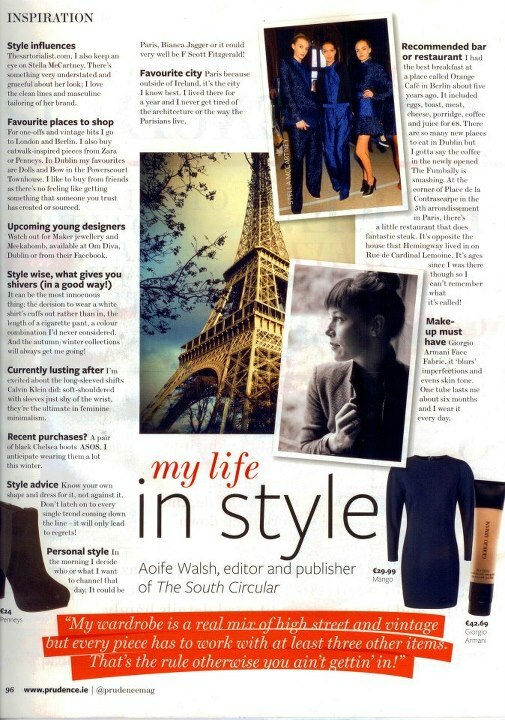 my life in style was a fun chance to express some sartorial favourites and to give Paris and Berlin a friendly plug. September is always a time of turning attentions toward the substantial, reliable and fierce. The theme was continued when we went to see the Diana Vreeland documentary, The Eye Has To Travel, as part of the monthly fashion/filmclub, Fashion Screen, in the Lighthouse cinema. Vreeland was fashion editor of Harper’s Bazaar and Vogue for most of her career and appears to have inspired The Devil Wears Prada more than Anna Wintour would care to acknowledge. Major publication envy ensued.